The 34 acre Freedom Park is located adjacent to the Camarillo Airport. The new Freedom Park Baseball Complex features lighted baseball fields - 4 youth and 1 adult. Also at the park is the Freedom Park BMX Raceway, a dirt track open for BMX racing and practice. For those who like to race remote control cars there are dirt and asphalt tracks available at the Freedom Park R/C Track. The Freedom Park In-Line Hockey Rink is the place to be if roller hockey is your thing. Lastly, Freedom Park has picnic tables, BBQ grills, horseshoe pits, a playground, and restrooms. 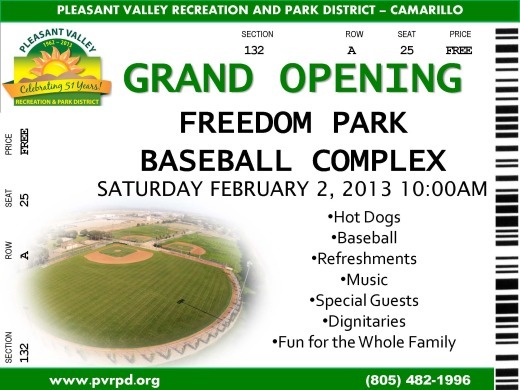 On Saturday, February 2, 2013 at 10am, Pleasant Valley Recreation and Park District is hosting a grand opening events form the new baseball complex. To learn more, visit www.pvrpd.org/parks/active/freedom.asp or call 805.482.1996.